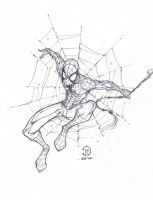 So there we go with the pencils for this spidey!! Click in dowload to get the full hi res (4677x3307) if you wanna give a try and paint it. dude.. i just had to say that this pencil work is just amazing.. i absolutely love it.. great job.. total respect..
darklp, no sé cómo le haces para q kede tan limpio, manualmente o con photoshop?, como sea, está cool. ya pero no luce iguan ni de leeeeeeeeeeeeeeeeejos! ...don't wanna seem like a geek who knows nothing, but what's up with all dots in the download/hi-res image...? -are they for some kind of "effect" at lower res?! Aha, I see... Silly lil' me! -Well, so now I know...! Just keep the awesome'z comin, LP!! hey did u put these pencils through photoshop before making it a deviation? Sweet Drawing, Just a thought though. There's a bit of a continuity error. Venom doesn't set of Spidey's Spider Senses, because of the time he spent as spidey's suit. Not a big thing, but that's the only flaw with this drawing. The artwork is impeccable. Keep up the good work Dark. I so love the Spidey pose, and the style he was done in. By the way, get a load of this! omg, best spidey lines ever, I am gonna give it a try for colors! I orginally commented on pixeltool's color verson, not knowing he only did the color and you did the line art. He corrected me on that and so here I am. q se zampe al spidey yaaaaaaa! and what do you want me to do about that? to post it here or what? hey, no it doesn't bothers me at all, don't misunderstand please. but did you want me to post it here or what? I just didn't understand what you was askind dude. just submit it and I'll put a link in the journal or whatever, ok? pues a mi si me gusto el de Ramos, horteras, q sois todos unos jodidos horteras setenteros. slick dude! Love the saliva coming from his tongue! me encanta como te quedo esto. hahaha decidi hacerlo mas clasico basado en las numerosas criticas en plan "si a la ramos mola mucho, pero ... no es venom"
wanna know how you make your final pencils line .... plz answer me.. how you gave them that simulation at pressure .... ?? ?